An active plate is also known as a Schwarz plate because A. M. Schwarz developed the plates into a system device, mainly used as retentive appliances. He transferred the typical retentive components to a simple expansion plate, including the arrowhead clasp he designed, and he fitted numerous active spring components for correcting defects of tooth position and the dental arch. Development of the two-thread expansion and tension screws furthered the design of the active plate. The basic form of active appliances is the sagittally split plate, which is initially fitted with two simple Coffin springs and allows selective expansion of the anterior or posterior dental arch area. The highly variable design of the active plate-divided into several segments selectively movable against each other—greatly extends the range of uses so that nearly 90% of all anomalies of tooth position and dental arch can be corrected. The effect of the appliances can be adapted very precisely to the particular case being treated by means of the direction of cut and variable division of segments, the use of several different screws, and omissions at the plate edge. Division of the active plate into movable appliance segments follows three basic cut directions: (1) the sagittal split, (2) the transverse split, and (3) the Y-split, as well as combinations of these. Another possibility is a selective split for singletooth movement, which leads to stationary application of forces. Each of the tooth movements and dental arch corrections indicated by the different splits is possible in the opposite direction if opened screws are used with broadly worked division cuts. The screws are twisted together for orthodontic tooth movements. 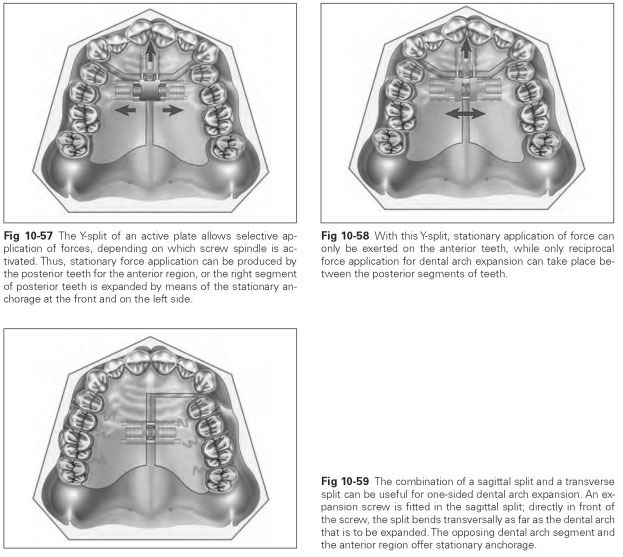 Once again, given movement thrusts on one side, the larger section of the dental arch is used as retention for stationary application of force. For anchorage of the movable plate segments, the previously described retentive components and support spikes are fitted, while active spring components are attached for selective singletooth movement. It is important to ensure that the appliances do not have too many components. It is always safer to carry out one correction at a time, using successive appliances for further correction. The sagittal split is usually symmetric in the middle of the plate.The split is widened by means of the expansion screw, leading to bilateral expansion of the dental arch (Figs 10-53 to 10-55). As a rule, reciprocal application of force occurs. If the plate edge avoids a few teeth, these teeth will be excluded from the expansion. It is therefore possible to exclude all the anterior teeth from the expansion with a sagittally split plate. In fact, retrusion of the anterior teeth can be performed with a close-fitting labial bow at the same time as expansion of the posterior teeth because the bow is activated more and more during expansion of the plate. The transverse split is made level with the canines and allows protrusive movement of the anterior teeth. At the same time, labially displaced canines can be pulled into the dental arch with retrusion springs. 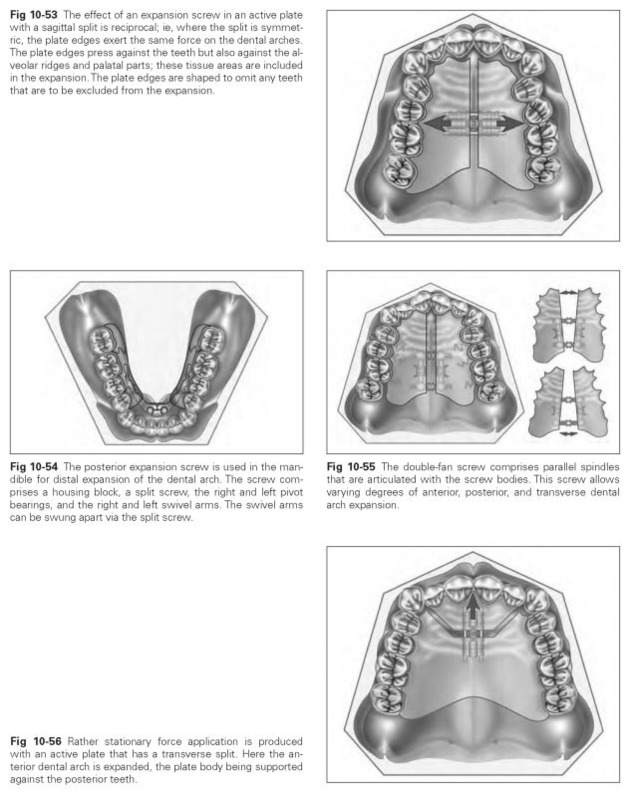 If the posterior plate segment is fixed to the posterior teeth, stationary forces are usually applied with a transverse split because the relatively immobile posterior teeth are only subliminally loaded in a labial direction during expansion of the dental arch (Fig 10-56). The transverse split can also be used for selective expansion of sections of a dental arch or single-tooth movements. In the case of unilateral canine crowding with mesially migrated posterior teeth, the plate is divided on one side at the level of the canine and fitted with an expansion screw. By means of the screw force, the posterior teeth are moved distally and the canine is moved into the dental arch with a retraction loop from the labial bow. Even if individual teeth at the end of the dental arch have to be moved distally or mesially, a transverse split in the plate can be employed. Combined tension and expansion screws enable selective tooth movement via two transverse splits. A combination of sagittal and transverse splits can be useful for unilateral dental arch expansion: An expansion screw is fitted in the sagittal split; directly in front of the screw, the split kinks transversally toward the dental arch that is to be expanded.The opposing dental arch and the anterior teeth offer stationary anchorage. The Y-split is a practical combination of a sagittal and a transverse split, making it possible to apply combined (reciprocal and stationary) forces to three segments of an appliance (Figs 10-57 to 10-59). The typical Y-split has the sagittal cut running from the dorsal up to the middle of the plate, where it splits into two angled transverse cuts to the approximal areas between the lateral incisors and canines. Two expansion screws in the angled transverse cuts move the three segments against each other: If two expansion screws are opened to the same amount simultaneously, the anterior teeth move markedly in a labial direction and the posterior teeth move less markedly in the vestibular direction; the dental arch is slightly expanded. Bilateral crowding can be corrected by moving the anterior region forward. Stationary application of force can be achieved by selectively opening one screw, then the other; in the process, the posterior teeth are moved vestibularly as well as distally and on the side where the screw has been opened. Selective single-tooth movement can be performed with a Y-split incorporating a sagittal cut that runs far forward and a transverse cut placed perpendicular to that. This will prevent expansion of the posterior region, while the posterior teeth move distally and labial anterior movement remains weakened. If even less movement of anterior teeth is planned, the Y-split is modified to block anchorage of the middle plate segment: Two sagittal cuts are made while a wide middle segment remains for the anterior teeth. The transverse cuts may run obliquely or vertically to the sagittal cut and hold the expansion screws. If one expansion screw then the other is moved alternately, stationary force application is possible with the anterior region remaining stationary as the posterior teeth are moved alternately distally and outward. A Y-split with a multisector screw for transverse and sagittal thrusts permits protrusive movement of the anterior teeth separate from expansion of the posterior region. Selective distal thrust of a posterior segment of teeth alternated with the opposite side can also be achieved with a multisector screw.